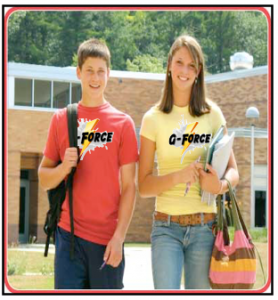 The G-Force consists of two students from each homeroom chosen by the homeroom teacher in whatever manner s/he chooses you. Their job is to build an attitude of gratitude within their class throughout the year and to promote activities in their homeroom that have been designated by the A-Team for each appreciation day. Building an Attitude of Gratitude. The G-Force is charged with inspiring students in their homeroom to recognize the contributions of others and to express gratitude to them throughout the year not just on appreciation days. not just on their appreciation day. Appreciation Day Assignments. On appreciation days, G-Force members will be asked by the A-Team to lead their classmates in a specific activity to celebrate the employees being honored. The G-Force Adviser will share the assignment with G-Force members. G-Force members will have an opportunity to be creative in the way they exercise the assignment and in finding ways to encourage participation by their classmates.